Karen Gillan has provided some Nebula information for Avengers: Endgame. The character has come a long way from being a villain in 2014's Guardians of the Galaxy and has a new role in the final Avengers movie. Promotional material shows her on the Benatar with Tony Stark as they drift through space while running out of food and water. However, it is clear that dying in space will not be their fate as we have learned more about Endgame, and Nebula could prove to be a major threat to Thanos. 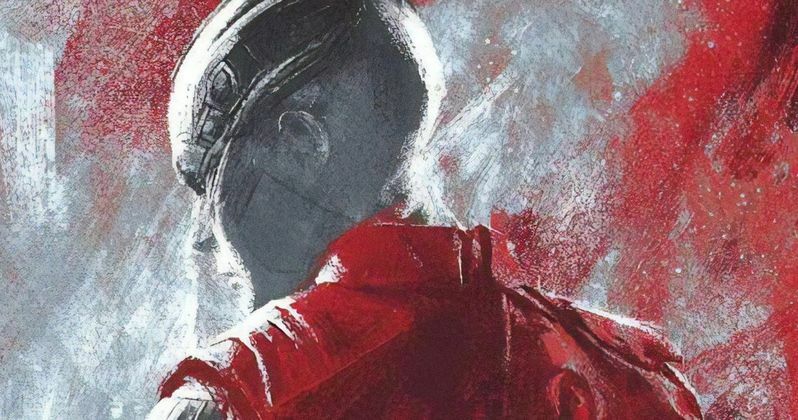 In a recent interview, Karen Gillan was asked about Nebula's role in Avengers: Endgame. The actress obviously was not able to say much, but she did say something pretty intriguing when asked about the possibility of the movie being the last for her character. Gillan explains. "I think I would be really sad to say goodbye. I've loved her from the moment I auditioned for her. She's evolved from a villain to someone we've developed empathy towards. I think she's going to be a character we're all rooting for." As for rooting for Nebula, that sounds about right. The former deadly assassin has a lot of things to address when she meets up with her father again. Nebula and Tony Stark are floating through space after escaping Titan as the lone two survivors of the Decimation on that planet. The Decimation is enough to be angry at Thanos for, but that's not even the top factor on Nebula's list. The Mad Titan tortured Nebula throughout her entire life as he pit her against her sister, Gamora, so that they would become better warriors. Nebula was treated considerably worse and when she finally came into loving her sister again, Thanos killer her in his quest to retrieve all 6 of the Infinity Stones. There have been rumors that Avengers: Endgame will see Nebula be the one to finally bring down Thanos. This would be fitting, but it is unclear at this time just how big of a role the character will have in taking down her father after all of the terrible things he has done. There are some Marvel fans that hope the story will twist like it does in the comics where Nebula becomes the one to wield the Infinity Gauntlet, which would be pretty interesting. As far as the return of Gamora, that is unclear. We know that Zoe Saldana was on the set of Avengers: Infinity War and recently just wrapped yet another round of secret reshoots. However, it is not clear if these scenes will be used for flashback purposes or if Nebula and Gamora are going to be the ones to bring down the Mad Titan after some use of time travel through the Quantum Realm. Whatever the case may be, Marvel Cinematic Universe fans are ready to see what happens next. The interview with Karen Gillan was originally conducted by Empire Magazine.